Large, widely-scattered farms and halls with small areas of parkland set within landscape of generally large rectilinear fields. Part of the ancient ecclesiastical parish of Llanfair Dyffryn Clwyd and within the medieval commote of Llannerch, part of the medieval cantref of Dyffryn Clwyd, which became the lordship of Ruthin after the Edwardian conquest of Wales. The earliest evidence of human activity is represented by two stone axes of late Neolithic or early Bronze Age date, probably found near Coed Cochion in about the 1830s. A Bronze Age axe found in about 1860 on land belonging to the Llwyn-ynn estate. Cropmark ring-ditches near Cefn-coch and Llysfasi probably represent early Bronze Age burial mounds which have now been ploughed flat. Possible activity in the Roman period is represented by a cropmark double ditched enclosure between Llanfair and Plâs-newydd, which possibly represents a Romano-British farmstead or possibly a temple. Gently undulating valley-bottom land, ranging in height between about 80-120m. The low ridge on which Llanfair Dyffryn Clwyd falls and the slight valley of the Dwr Iâl stream to the west of Craig-fechan and to the east of Llanrhudd both form reasonably distinct subdivisions of the area. Settlement is characterized by dispersed and relatively large farms or halls, generally between 700-800m apart, a number of which are set in small areas of mature parkland, as at Garthgynan, Plâs-newydd and Pentre Celyn, some with walled gardens, entrance gates and lodges. Llanfair Dyffryn Clwyd forms the focus of an extensive medieval parish, today consisting of medieval church, 19th-century school and almshouses, inn, 18th and 19th century cottages, all largely of limestone with slate roofs, some with dry-stone walled gardens, and with some 19th- and 20th-century brick houses, village hall and other buildings, and war memorial. The church was in existence by the mid 13th century. Little is known of the early history of the settlement although it is known to have become no more than cluster of about six houses surrounding the church by the end of the 17th century. Three other small nucleated settlements fall on the margins of the area - a small scattered nucleation with two 19th-century chapels east of Llanfair Dyffryn Clwyd, a nucleation of several 18th- and 19th-century cottages, houses and small farm at Pentre-côch, and a small nucleation between Capel-y-glôch and Capel-y-fferm in the vicinity of Jesus Chapel, an 'office church' first established in 1619. 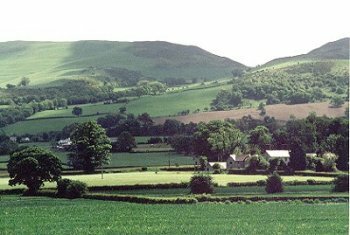 The area includes the Llysfasi College of Agriculture based upon the early 17th-century house belonging to the Myddleton family at the southern end of Dyffryn Clwyd, and the modern Cattle Breeding Centre, to the south-east of Ruthin. Little medieval building survives apart from the medieval stone church at Llanfair Dyffryn Clwyd, whose fabric is mostly of 15th- and 16th-century date. Timber and thatch was probably the predominant building material until perhaps the earlier 17th-century, examples of buildings of box-frame construction being recorded at Cefn-coch, Llysfasi and Plas Llanrhudd. From the early 17th century onwards stone and slate became the predominant building materials for farmhouses and outbuildings as for example at Bryn Coch, Capel-y-fferm, and including rendered stonework as in the case of the 17th-century house at Plas Newydd. Brick became more commonly used during the 18th century, as in the example of the large farmhouse at Ty Newydd and outbuildings at Cefn-coch and became increasingly used for outbuildings during the 19th century. Present-day land-use is predominantly pasture. Natural drainage is impeded on some of the lower-lying ground and must have imposed seasonal limitations upon land-use over large parts of the character area before drainage dykes and ditches were first dug, possibly during the early post-medieval period. The area is characterized by relatively large rectilinear fields which largely represent post-medieval or recent enclosure of common meadow land although there are traces of ridge and furrow in fields on the south-western edge of the village of Llanfair and in the Coed Cochion area which may be evidence of medieval open fields. Fields are bounded by mature and generally robust low-cut multiple-species hedges with scattered larger mature trees. Relict field boundaries are occasionally represented by lines of mature trees running across areas of grassland. Stream courses often distinguished by larger trees and shrubs and there are small stands of pine trees around some houses. Single gateposts or pairs of gateposts of roughly hewn limestone blocks are characteristic of roadside gates. Roads are largely relatively straight with traditional dry-stone bridges across streams. There were mill on the Dwr Iâl stream at Melin Garthgynan, the buildings of which are still extant. The area includes the imposing medieval church dedicated to St Cynfarch and St Mary at Llanfair Dyffryn Clwyd set within rectilinear churchyard, is largely of 15th-century build but is known to have been in existence by the middle of the 13th century. Jesus Chapel, founded in 1619 to the south-east of Llanfair, and two nonconformist chapels to the east of Llanfair, Capel Seion a stone Baptist chapel of 1840 and Bethel Chapel, a brick Wesleyan Methodist chapel of 1845 (founded 1802). The area includes two gardens listed in Register of Landscapes, Parks and Gardens, Garthgynan, a 17th-century walled garden bee boles, orchard and fishponds, and Plâs-newydd a 17th- and early 18th-century walled garden and small park, and a small area of parkland character at Pentrecelyn Hall.